Current energy systems rely heavily on petroleum/crude oil to generate power but their production and use have contributed to climate change and pollution. Scientists and designers have discovered sustainable alternatives to crude oil such as solar panels and wind turbines, but their implementation is limited by economics, politics, and geography. 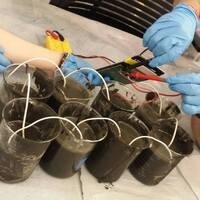 The microbial fuel cell is currently being researched as an alternative form of energy that can both treat and create energy from wastewater and locally sourced sediment. The microbial life in these systems has evolved to survive and carry out metabolic processes to transfer electrons from molecule to molecule. We can harness this process by designing a circuit that directs the flow of these moving electrons such that they can be captured, thus, creating a microbial fuel cell. Join us as we explore genomics and ecological research to utilize biodiverse bacteria identified to be highly electrogenic and suited for this emerging technology as well as the manipulation of variables that effect texture, consistency, and rate of synthesis. This event is sponsored by The Department of Natural Sciences & Mathematics, Eugene Lang College of Liberal Arts and The Provost Office. Microbial Fuel Cell Video: “The Microbial Fuel Cell.” Sebastian De Bruin. YouTube. April 2013. Link.